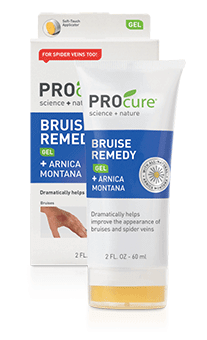 Protect Your Bruises with PROcure Bruise Remedy Gel (Coupon + Giveaway) | A Savings WOW! Have you ever had a bruise that leaves some discoloration? Do you wish there was a way to help improve that discoloration? PROcure Bruise Remedy Gel is a unique topical gel that dramatically helps improve skin discoloration due to bruising and spider veins. It is a high quality, soothing, botanically rich formula concentrated with Arnica Montana and MSM plus it’s in a convenient portable size. The gentle “no touch” applicator dispenses gel without applying painful pressure to tender bruised area. Make sure you keep it in your medicine cabinet and use it immediately after a bump or fall – even before a bruise appears. An additional coupon is in Valpak envelopes, so keep your eye out for the blue envelope in your mailbox! 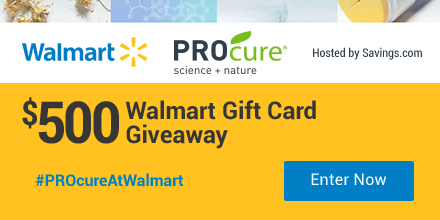 Redeem your coupon for PROcure Bruise Remedy Gel at Walmart. Ten (10) winners will receive a $50 Walmart gift card. The giveaway ends on Tuesday, August 8th at 11:59 PM ET. The winners will be chosen through a lottery drawing and notified on Wednesday (8/9) via the email address they used to enter. See complete Official Rules for entry instructions, full prize descriptions, restrictions and other important details. Disclaimer: No purchase is necessary to enter. Void where prohibited by law. The odds of winning are based on the number of entries received. The sponsor(s) will be responsible for product shipment to winner(s) of this giveaway. My blog is not responsible for product shipment/delivery. This event is in no way administered, sponsored, or endorsed by, or associated with, Facebook and/or Twitter, Google, Pinterest, or Instagram. This disclosure is done in accordance with the Federal Trade Commission 10 CFR, Part 255 Guides Concerning the Use of Endorsements. It is at the sole discretion of the admin of the giveaway if the winner has met the rules or not.